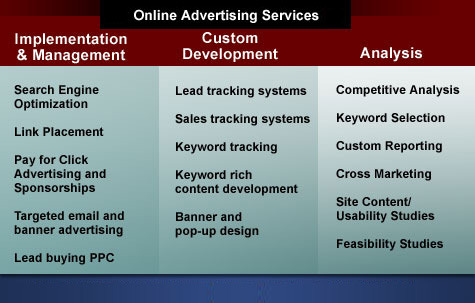 Top 10 positioning in search engines is the most effective form of online marketing. Our proven procedure will guarantee top 10 results. Our goal is to design and implement an online marketing strategy that will enable you to obtain more customers in a cost effect manner. For us, the best gauge of a successful marketing campaign is actual sales. Ultimately, we want to help you grow your business and brand. Depending on your budget and goals, NetworksIP offers many services to help you meet your sales objectives. Search Directories and Search Engine Spiders. Each search engine (regardless of whether it is a spider or a directory) uses unique criteria for "ranking" web site's, many on and off page factors are looked at when determining whether a page is relevant for a particular term or not. The article below briefly explains the differences between the two types of search technology. 1. Spider driven search engines use "robots" to spider website's across the Internet. Robots "crawl" each web site and "score" pages based on relevancy. Some engines score the index page while others score individual web pages. A web site's score or placement within a spider driven search engine is derived from hundreds of variables such as, link popularity, click popularity, keyword density, web site themes and more. Google is the most popular spider driven search engine. It's database currently has about 4 billion pages indexed and is known for finding the most relevant information. 2. Search Directories/Portals rely on humans to gauge web page relevancy and search engine placement. Human editors review each web site and rank them according to a set of guidelines such as web site content, web site functionality, and design professionalism. Yahoo! and the Open Directory Project: DMOZ, are the most popular search directories. Yahoo! now has taken over Inktomi and now uses it's crawler to populate their search result listings, which is now Yahoo! search. Yahoo! also recently dropped Google's results from their results and in turn will use their new crawler for results as well as paid inclusion (PI). Overture also provides some paid listings. 2. Search Engines constantly modify "page ranking criterions"
Why Search Engine Ranking Optimization? Studies have proven that top placement in search engines provide a more favorable return on investment compared to traditional forms of advertising such as, snail mail, radio commercials and television. Search engine optimization is the ONLY fool proof method to earning guaranteed Top 10 search engine placement. Another term for a search engine's ranking formula is a search engine algorithms. The goal in search engine optimization is to build a web site that meets each search engines "ranking criterion. The closer a web site matches each search engine's "ranking criterion, the higher the web site scores. Higher scores equal better placement in search engines. The best scores are rewarded with Top 10 search engine placement.